Chiefs’ backups almost win, but did Reid make the right call to rest starters? 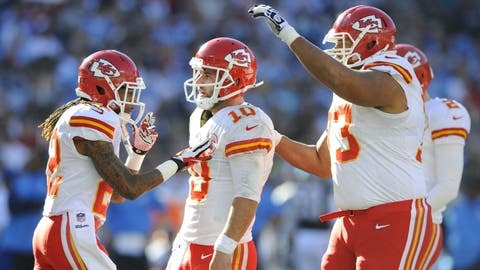 Chase Daniel celebrated his first NFL touchdown pass on Sunday -- a two-yarder to Dexter McCluster. KANSAS CITY, Mo. — Five things we learned from the Chiefs’ 27-24 overtime loss to San Diego. Andy Reid indicated he made the decision Saturday to rest most of his starters for Sunday’s game. I’m sure that didn’t amuse the Pittsburgh Steelers or their fans, because the Steelers could have made the playoffs if the Chiefs had won. But Reid has to worry about his own team first, not the playoff fate of others. And Reid has done this before in Philadelphia — resting his troops in a meaningless game before the playoffs — and he obviously swears by it. On the pro side of the rest-or-not-rest ledger is that several Chiefs players coming back from injury, most notably Justin Houston and Branden Albert, got another week to heal without the risk of getting re-injured. Having a healthy Houston back on defense in the first round against Indianapolis will give the Chiefs a touch of nastiness again, especially in their pass rush, and that element has been sorely missed since he got hurt. And in many ways, Houston, a powerful and explosive hitter, will give the Chiefs’ defense its identity again. The other benefit is that workhorse running back Jamaal Charles got a much-needed break. He will go into the Indy game with much fresher legs than he had in the first meeting with the Colts. On the con side to resting so many starters is that the Chiefs could have used a win to snap a losing mentality that has crept into the locker room. The Chiefs now have lost five of their past seven and are going into the playoffs with seemingly no momentum at all. Most successful playoff teams are the ones that get hot in December and ride that wave through January. That’s not how I’d describe the Chiefs right now. It’s understandable that Chiefs fans were upset with the strange call in overtime on the fake punt by the Chargers. The game seemingly ended when the Chiefs grabbed a fumble on the fake and ran it back for the winning touchdown. The Chiefs were so convinced that it was a touchdown that their entire bench rushed the field in celebration. And do you think at that moment that they were celebrating in Pittsburgh as well? That play would have put Pittsburgh in the playoffs. But it was all for nothing because the officials ruled that the forward progress of Eric Weddle, the ball carrier, had been stopped before the fumble and after he reached the line to gain. And forward progress is not reviewable. Coming into this season, quarterback Chase Daniel had thrown nine passes in three seasons with the Saints while watching Drew Brees from the sideline. Sunday’s game marked the most extensive playing time Daniel had seen since he was a Missouri Tiger. And all things considered, Daniel played smart and played well. He completed 21 of 30 for 200 yards, and he threw his first NFL touchdown pass, though granted it was just a two-yarder to Dexter McCluster, who did all the work while fighting his way into the end zone. But Daniel didn’t make the big mistake Sunday, played with poise and committed no turnovers. Daniel also showed he remembers how to run, rushing for 59 yards, including a key 29-yard scramble on third-and-five in the first half. Daniel, according to Reid, also made several excellent check-downs at the line of scrimmage. And he nearly beat a San Diego team in a fight for its playoff life. Pretty impressive. Daniel wasn’t the only player on the Chiefs’ junior varsity that shined Sunday. Wideout Junior Hemingway, whom many Chiefs fans believe should be getting more playing time anyway, showed he can be a valuable part of the offense. He posted career highs in catches (five) and yards (45) and demonstrated that he can use his big body (6 feet 1, 225 pounds) in tight spaces to make big catches. Defensive end Allen Bailey also was a factor, registering a team-high seven tackles. And, of course, running back Knile Davis showed us what we already knew: He can be a punishing north-and-south runner with burst — he had 81 yards and two touchdowns on the ground. I’ve already heard a pretty amusing theory that it was a good thing that the Chargers beat the Chiefs because the Chargers, the theory goes, have as good a chance as anyone to upset the top-seeded Broncos, and then if everything else falls right, the Chiefs could host the AFC championship game. Here’s how that scenario breaks down: The Chiefs beat Indy, then upset New England on the road, while San Diego beats Cincinnati and then upsets Denver the next week (as the Chargers did a few weeks ago). That would put the sixth-seeded Chargers at Arrowhead to face the fifth-seeded Chiefs in the title game.